Composite fillings are the ideal cosmetic dental treatment for patients who take pride in the appearance of their teeth. This type of filling is extremely adaptable. A composite filling can change the color, structure or shape of a tooth. Although composite fillings mostly serve as a restorative treatment, they are also a practical way of improving the look of teeth. If you have severely discolored teeth, composite fillings can restore the color balance. You will have a much more natural smile without anyone noticing that you have had dental work. The composite filling is applied to the surface of the existing tooth and then filed down and polished into shape. A special tool is used to complete the process in layers. This allows the composite filling to harden with each application. Composite resin is a mixture of materials (usually plastic and glass) used to fill cavities, change the color of the tooth or reshape a tooth. In some cases, composite resin is also used to reduce gaps between the teeth. Composite resin does not typically last as long silver fillings when used in teeth with large cavities. However, composite resin is just as durable for filling smaller cavities. As the material is a resin, your dentist can match the color of your filling very closely to your natural tooth color. From a cosmetic point of view, this one attribute alone makes composite resin the far superior choice. Patients with composite resin fillings are able to smile freely without feeling self- conscious about noticeable fillings. 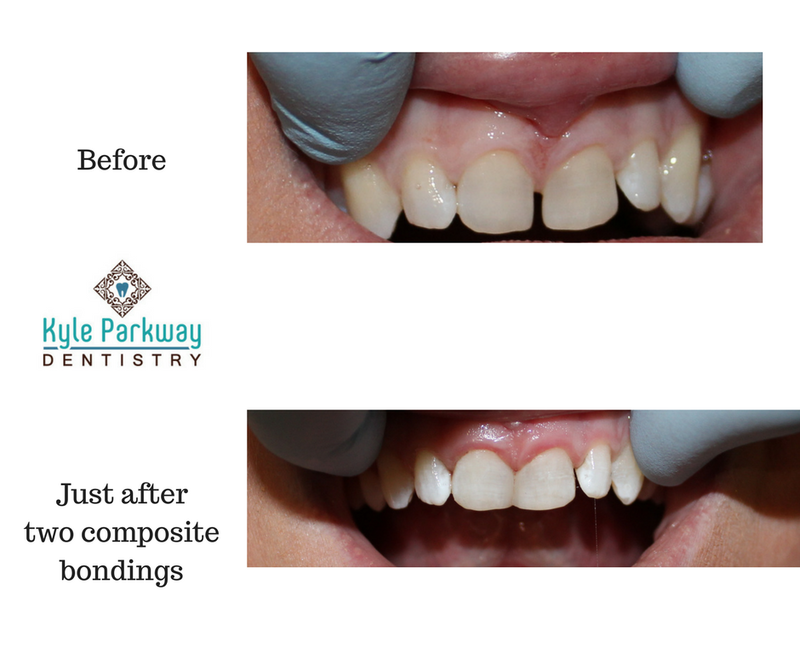 At Kyle Parkway Dentistry, we can restore your smile through the application of composite resin based fillings. It is important to address cavities early, as composite resin can be used as a filling and help prevent further decay. If you are self-conscious about the shape or color of your teeth, contact Kyle Parkway Dentistry today to book an appointment. Composite fillings may change the way you see your smile.